The MycoMate® McKennaii XL magic mushroom grow kit is slightly different than the grow kits you may have used before. These are mainly 'under the hood' differences and are not easily seen. Close any open windows. Wind or draft may bring microorganisms that can contaminate the MycoMate® 'McKennaii' XL Magic Mushroom grow kit. When taking out the grow box with the cake from the carton box, put it on a disinfected surface. If this surface would not be clean, micro organisms may attach to the grow box and will flourish inside the MycoMate® 'McKennaii' XL Magic Mushroom grow kit, and will contaminate the grow box. Place the paperclip on the fold, so the bag stays closed. Now the MycoMate® 'McKennaii' XL Magic Mushroom grow kit is ready to grow. 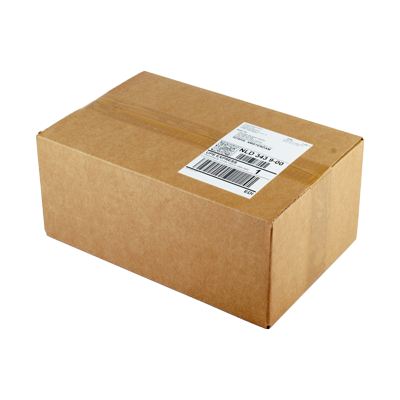 Place the MycoMate® 'McKennaii' XL Magic Mushroom grow kit inside the carton box, on top of the ziplock with lid. The MycoMate® 'McKennaii' XL magic mushroom grow kit only needs light for the mycelium to ‘understand’ it has reached the surface. Only then, mushrooms will grow. A few hours of fluorescent/artificial light or indirect sunlight a day is more than enough. Direct sunlight kills the mycelium, so avoid the sun to shine directly on the grow kit. To continue, follow the same steps 3 – 7 as before when you started the process for the first time. Several days later, a new flush will appear. 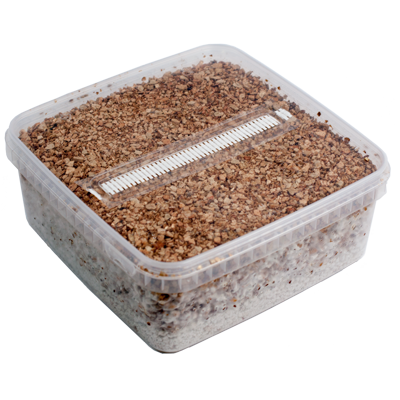 You can get at least 2 or 3 flushes out of a MycoMate® 'McKennaii' XL Magic mushroom grow kit. If you are experienced in cultivating, you can get more flushes out of a kit. When no more mushrooms grow out of a grow kit after the second flush for at least three weeks, or when the MycoMate® 'McKennaii' XL Magic Mushroom grow kit turns green, red, grey or yellow; the grow kit can be disposed of. The change in color is a sign that the grow kit is contaminated with another fungus or a bacteria. No more mushrooms will grow out of the MycoMate® 'McKennaii' XL Magic mushroom grow kit and the grow kit should be thrown away in the garbage outside. Not so many fruits but good high! Probably due to my own mistake, I only got about 450g out of three flushes. It's probably just about finished now (third flush just finished). We've tried three times now. The first time I had 2.5g (dried) and my wife had 1.5g. We had a nice happy buzz with slightly enhanced colours. The second time we went up to 3g and 2g. This time, there were some visuals and it was a really happy positive experience; lots of laughing and a really fun night! The third time, I was going through a bit of a difficult time, and I needed some answers. I took 4g. I didn't watch TV this time, and then went for a bath with candles. The following 2 hours was a really intense time: it was a really introverted experience, and in the end, I did get all the answers I was looking for. I almost felt like I was reborn! So there we go. I wouldn't go that high again the future, unless I had a particular reason, 3g is a nice evening for fun with friends and that's where I would mostly stay! First mushroomw appeared after aprox 3 weeks. A total of 705 grams of fresh mushrooms. I'm happy with the result of my first box. Mushrooms are realy potent and the effects began immediately after we ate them. We had 5 grams dried. After 15 mins the patters where everywhere and after 30 minutes we could only sit on the couxh and enjoy all the patterns and colours with our eyes open. We yelled constant how great life was. Voila en 1 mois j'ai déjà eu 4 belles flush et la 5 arrive. De bonne qualité, festifs, joyeux, idéal pour les belles journée d’été. Kit ist super und wächst genauso gut wie alle anderen die ich sonst hatte. Bin also sehr zufrieden vorallem auch beim Preis! Bonjour à toutes et à tous , comme convenu je reviens donc pour raconter la culture, récolte et voyages avec les différentes espèces proposées c'est un vrai bonheur, donc 1°flush McKennaii XL et j'avais 256gr ~ aprés secha sur journal de 55gr ~. Pour ne rien oublier, McKennaii XL sont vraiment de bonne factures et je reviendrais d'ici pour vous donner plus d'infos sur le 2 autres commandes faite 3 / 4 jours d'intervalle.Je vous informerez à chaque nouvelles fushes de chaque espèces. Je vous dis à bientôt, restez vigilants, prudents et ne restez pas seul pour vos voyages ;-).